Companies like Wedgies are bringing polling to the masses so anyone from bloggers, to journalists, to TV execs can connect with their audience and gauge sentiment in real-time. Wedgies is now the first fully integrated polling and survey option on Tumblr. This means Tumblr’s user base of roughly 110 million can now embed polls and surveys on any one of the 94 million posts published daily, straight from their dashboard. 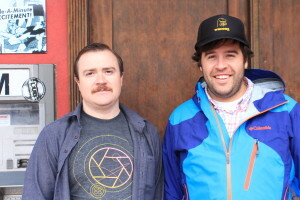 We caught up with Wedgies co-founders Jimmy Jacobson (pictured left) and Porter Haney (pictured right) over tacos and pancakes at SxSw to talk about what’s new and where Wedgies is headed. Growing up, I watched Sesame Street everyday without fail. My Dad, a writer for PBS at the time, would ask my sisters and I, “Who do you like better Cookie Monster or Count Von Count?” This was the most sophisticated method of polling available at the time. Times have changed. To Porter and Jimmy, audience interaction through polls and surveys is a sign that readers are more interested in building an experience rather than simply consuming one. Wedgies’ integration with Tumblr is a step in towards enabling audiences to be consumers as well as creators. Tumblr users can share a poll without hassling with HTML. All you have to do is paste your URL into a video post and it’s up and running in the Tumblr Dashboard and on the Tumblr blog network. I’ve thrown a little poll below as well featuring my Dad, John, in the days where he hung out with Big Bird. Who is taller: Big Bird or John? USA Today, The Weather Channel, and The Next Web already use Wedgies’ polling to gather feedback from their readers, and then display that data on their site in real time. The NCAA displayed Wedgies’ polls on jumbotrons at basketball games so audience members could vote on which dunk they liked the most via Twilio SMS. With Wedgies new integration with Tumblr, we can’t wait to see what readers will build next.